Thar She Blows – A day full of MOBY – Outlander Retreat Main Event Part 1 | Great Scot! So the day I have so eagerly anticipated has finally arrived. Thanks to a body conveniently still running on Eastern Daylight Time combined with an early Seattle sunrise, I was awake bright and early this Saturday morn. After completing my morning Social Media routine — the only morning exercise routine in which I am generally willing to engage, I headed down to the hotel restaurant for a quick breakfast. That essential task completed, it was time for my roomie and I to jump in a cab to head to the Seattle Center for our special day. A funny thing happened in that brief ride. My heart began to beat just a bit faster and my anticipation kept building higher and higher. I had such expectations for this event, would the actual day live up to all the anticipation? Let me set your minds at ease and tell you: ‘Yes, it absolutely did!’ But, I digress. 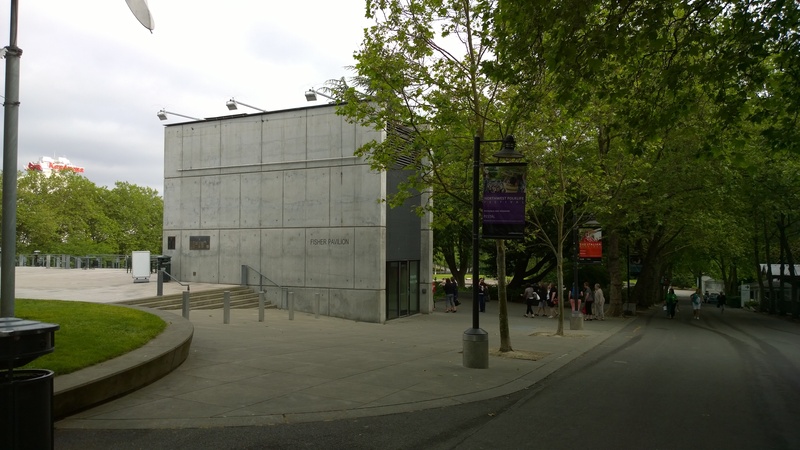 After a brief cab ride, we arrived at the Seattle Center and made the short walk to the Fisher Pavilion. I must confess I was a bit worried when I first spotted our destination. The event was billed as an intimate gathering, but this building seemed to promise a closeness I’m not quite sure I was willing to accept. Luckily, this turned out to be the elevator entrance for the Pavilion which was down a flight of stairs. Whew, first crisis averted. Upon descending the stairs, we were quickly checked in by the ultra efficient Random House staff and entered another world. Once inside, we were transported into the world of Outlander. I quickly found my way through the maze of fans to claim my bag-o-swag — including the long-awaited copy of MOBY. (Which, to be honest, is currently sitting on the end of my bed in the hotel room right now, calling my name. The blog comes first, however!) Next, I headed into the room where the festivities would begin and Diana’s Keynote and Q&A would be held. To pass the time, I cracked open my copy of MOBY to take a peek at the Acknowledgements. So why look at the Acknowledgements you may ask? Well, first, I didn’t trust myself to be able to STOP reading if I started reading the actual story; not even for Diana. Secondly, I played a very small part in helping to gather information and proofread the family tree that many of you will find in the end papers of the hardback copy of MOBY. In exchange for these efforts, Diana had graciously promised to include me and my nitpicking compatriots in the MOBY acknowledgements, and, sure enough, we were there! I have to tell you; It was very thrilling to see my name there in print. Are we in Claire’s Surgery? Note that the actual audio and video don’t begin until about the 1:22:00 mark in the video. OK, I have just been reminded that I did promise in an earlier tweet today to tell the story about Sam Heughan white, red and kilted. You really should listen to Diana tell this story herself in the recording, but here is the gist of it. Diana was relating the story of how she had once answered the question from a male German journalist about what was the appeal of a man in a kilt. Tired from a long series of interviews, Diana responded with the comment that it was likely the thought that you could be up against a wall with one in less than a minute. Now I’ve heard Diana tell this story before and it’s a really great theory but the piece de resistance in this version is her description of Sam Heughan’s response when she told him the story. First he went white… then his face went red…. then he started wearing his kilt everywhere, said Diana with that sly glint in her eye. Needless to say, that story brought the house down. After the keynote, Diana was drawn away to begin the personalization process for all the Outlander attendees’ copies of MOBY. As the initial signing groups began their journey through the line for their moments with Diana, the rest of us were entertained by the Seattle Comedy Group. Think of it as ‘Whose Line Is It Anyway’ meets Outlander with lots of fast-moving improve and audience participation. Once the Comedy troupe was finished, it was time for lunch on our own. But that, I’m afraid, will have to be a story for Part 2. I canna keep my eyes open much longer. Don’t worry though, there’s lots more to come! After party at the Space Needle! Great post, thank you so much. However there is no link to the keynote Is it possible to post it somewhere for all of us who missed it. The YouTube player with the keynote is embedded in the post. If you aren’t seeing it, it may be a limitation of the device you are using. However, here is a direct link as well. http://www.youtube.com/watch?v=sI7674zaAyM&feature=share I hope you enjoy! Thanks SO much for the breakdown! OMG! OMG! OMG! This is all so excitng! I wish I was there! I’m sorry I never found you to meet you in person, Mandy! But I’m glad you had such a great time! It was a wonderful weekend, wasn’t it! I know, Erin. That’s one of my only regrets of the weekend! Pingback: As Promised, the first Great Scot! giveaway is here… | Great Scot!